Context: Oral submucous fibrosis (OSMF) has a multifactorial etiology. Recent studies have shown that there is an increased level of fibrinogen degradation products (FDP) in plasma of OSMF patients suggesting its possible role in etiopathogenesis of OSMF. Aims: To detect the presence of FDP in the plasma of betel nut chewers with and without OSMF and in normal subjects without any habits, to correlate these levels with respect to the clinical and histological grading of OSMF and whether it can be used as a nonsurgical diagnostic aid in detection of suspected OSMF cases. Materials and Methods: Study comprised of 35 cases of betel nut chewers with OSMF, 10 patients with betel nut chewing habit but having apparently normal oral mucosa, and 10 normal patients without any habits. The patients were evaluated for plasma FDP levels. Results: All the betel nut chewers with OSMF showed the presence of plasma FDP. However, controls and subjects with habit, but without OSMF did not show FDP in the plasma. Spearman's rank correlation was used to find the association between the clinical and histological grades and it was not statistically significant (P = 0.910) and the correlation being 0.020. Conclusion: Since only those patients with OSMF have showed the presence of FDP in plasma, we suggest that our test can be utilized as a nonsurgical diagnostic aid in suspected OSMF patients. Context: Langerhans cells (LCs) are a unique population of antigen processing cells in the epidermis and mucous membrane, which may play a role in the defence mechanism against epithelial tumors. Aims: To compare the distribution of LCs in oral squamous cell carcinomas (OSCC) and normal oral epithelium; and to determine whether the population of LCs in OSCC has any correlation with histological grading of these malignancies. 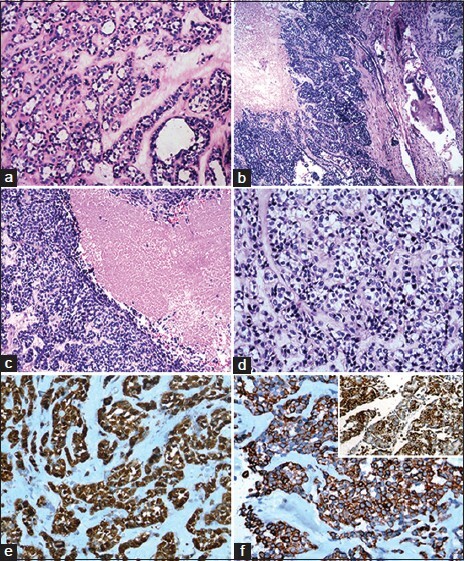 Settings and Design: A cross-sectional immunohistochemical analysis of OSCC cases. Materials and Methods: Forty-eight randomly selected paraffin tissue blocks of OSCC cases and 30 cases of normal oral epithelium were included. 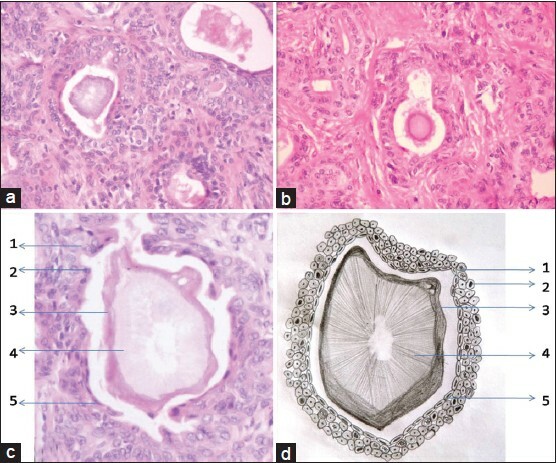 Hematoxylin and eosin-stained sections of the OSCC cases were reviewed and categorized as high-grade malignant tumors or low-grade malignant tumors. Tissue sections were analyzed for density of LCs using CD1a antibody expression. Statistical Analysis Used: Data are expressed as percentages compared by Chi-square statistics; mean ± standard deviation, compared by Mann-Whitney-U test and Spearman's correlation tests. Results: LCs population was significantly higher in normal oral epithelium when compared with OSCC cases (P = 0.001). There was also a significant difference in the number of LCs per millimetre square area of tissue section between well-differentiated tumors and poorly-differentiated tumours (P = 0.03). There was a negative correlation between the population density of LCs and the grade of OSCC. Conclusions: These findings suggest that oral mucosal LCs are involved in immune-surveillance and immunologic impairment may characterize invasive OSCC. In addition, LCs density characterizes histological grades of OSCC, which may be of a prognostic value. Context: Angiogenesis, the process that leads to the formation of new blood vessels, continues to be a topic of major scientific interest. There is an increasing hope that new discoveries will lead to newer therapies that target angiogenesis as a reliable option for disease therapy. Aims: The objective of this study was to assess the role of vascularity, correlation of morphometric aspects of vascularity, investigate its usefulness in the histopathological classification and prognosis in normal buccal mucosa (NBM), leukoplakia and squamous cell carcinoma (SCC) of buccal mucosa. Materials and Methods: The study sample consisted of 15 cases of NBM, 30 cases of leukoplakia, and 30 cases of SCC of buccal mucosa. The 75 archival samples were stained by hemotoxylin and eosin (H and E) and Masson's trichrome (MT). The stained sections were analyzed using image analysis software. Statistical analysis used : Statistical Package for Social Sciences (SPSS) 12.0 statistical software. Results : The combined mean vessel density (MVD) of all the cases in H and E was 0.1112 and for MT it was 0.2150. The difference of MVD between H and E and MT was statistically significant. The mean MVD in SCC (0.3455) for MT was higher than NBM (0.1314) and leukoplakia (0.1263). The mean MVD increased from stage III (0.3563) to IV (0.5312). It also increased from NBM (0.1314) to hyperkeratosis (0.1505) and decreased from grade I (0.3556) to II (0.2795) of oral SCC (OSCC). Conclusions: MVD can be used as an adjunct with other diagnostic modalities. Further studies are needed to standardize baseline levels for different sites and age groups. Background: Tissue engineering offers the means for replacing or repairing diseased organs within the patient's body. The current problem in its clinical use is sufficient and fast revascularization of the transplanted tissues. The idea of bone-reconstruction deals with three-dimensional bone equivalents that are composed of endothelial cells (ECs) and adipose tissue derived stromal cells (ATSCs) showing osteogenic differentiation. Materials and Methods: ATSC were isolated, cultivated until third passage and osteogenically differentiated by 1.25-dihydroxycholecalciferol. Coculture systems with human umbilical vein endothelial cells (HUVEC) were performed. Osteogenic differentiation was analyzed in FACS-analyses (n = 7), by the measurement of Ca 2+ -deposition in the cell matrix (marker for osteogenic differentiation) and the expression of alkaline phosphatase (AP). Results: Ca 2+ -deposition in the cell matrix and osteocalcin-expression correlated significantly (P = 0.030) during osteogenic differentiation (n = 7). The osteogenic cell differentiated ATSC in the coculture system (n = 6) even showed a clear increase of Ca 2+ -deposition. The time of starting the coculture did not influence the differentiation. Measurement of the Ca 2+ -deposition correlates significantly to the osteogenic differentiation and osteocalcin-expression. Conclusion: ATSC are a promising source for bone tissue engineering. They can be differentiated into osteoblasts in a coculture system with HUVEC without the loss of any differentiation capacity. For bone tissue-equivalent fabrication, this is an encouraging procedure that is feasible and provides fast revascularization of the bone-equivalents. Objective: This study was designed to compare the microbiological features of angular cheilitis (AC) in human immunodeficiency virus (HIV) seropositive and HIV seronegative individuals, in a group of south Indians. Materials and Methods: Swabs from oral commissures of 46 patients were obtained and inoculated on to Sabouraud's dextrose agar (SDA) supplemented with chloramphenicol, blood agar (BA) and MacConkey's agar (MCA) plates and cultured. α-hemolytic Streptococci, Staphylococcus albus, Staphylococcus aureus, Candida species, Klebsiella species and Pseudomonas species were cultured. 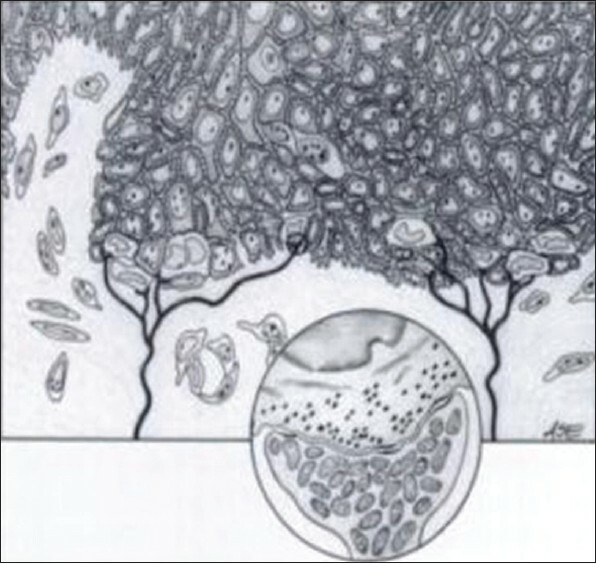 Candidal colonies were further speciated by the conventional biotyping technique. Results: In AC of HIV seropositive patients Candida albicans and Staphylococcus aureus were more prevalent than that in HIV seronegative patients. Incidentally in patients with CD4 cell count less than 200 there was an increase in the incidence of Candidal and Staphylococcus aureus colonization when compared to patients with CD4 cell count higher than 200. Conclusion: The present study suggests a definite difference in the microbial flora of AC in HIV seropositive patients than that of HIV seronegative population. Background: Dysregulation of cell cycle is a fundamental hallmark of cancer progression. Cyclin D1, part of complex molecular system regulating G1-S point of cell cycle is overexpressed in variety of tumors. 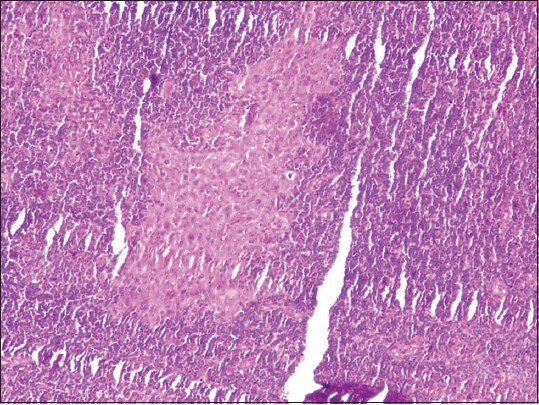 Aims: To look for its immunohistochemical expression in clinically normal mucosa from patients with and without tobacco habits, leukoplakia; and correlate its expression to individual atypical morphologic features, as seen in hematoxylin and eosin (H and E) sections of leukoplakia exhibiting dysplasia. Materials and Methods: We examined the expression of cyclin D1 in immunohistochemically stained sections of 15 normal buccal mucosa without any habits (group 1), 30 clinically normal mucosa from tobacco habituιs (group 2) and 30 leukoplakias exhibiting dysplasias (group 3). Descriptive statistical analysis performed. Results presented on Mean ΁ Standard deviation and in number (%). Adjusted Wald 95% Confidence Interval (CI) computed, percentages of morphological features assessed by Laplace estimate. Mann-Whitney U, Kruskal-Wallis test used to find the percentage expression of cyclin D1. Results: Expression of cyclin D1 in group 3 was significantly higher than in group 1 and 2 (P < 0.001, P = 0.028), expression in group 2 was significantly higher than in group 1 (P = 0.003) and were statistically significant. Generally expression of cyclin D1 was confined to lower one-third of epithelium and was highest in mild dysplasias. Among 13 atypical morphologic features, cyclin D1 expression consistently correlated with basilar hyperplasia. Conclusion: The altered pattern of cyclin D1 expression here may be an early event in conversion of normal epithelium into dysplastic epithelium and may serve as a biomarker of oral carcinogenesis. Its expression may be increased in tobacco habituιs. 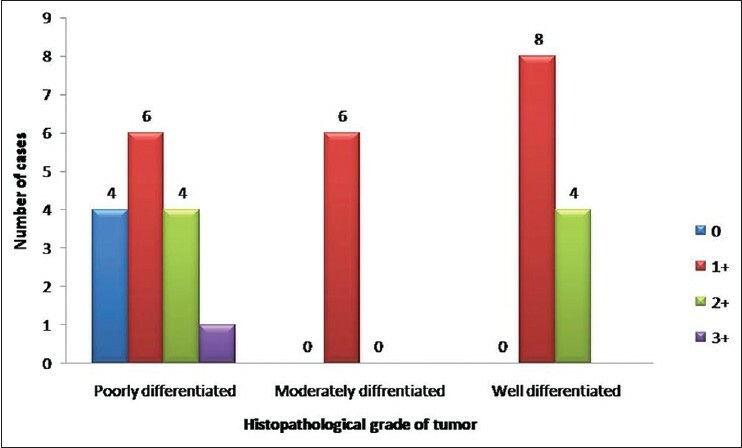 Basilar hyperplasia should be given additional weightage in the grading system in predicting the fate of affected epithelium. 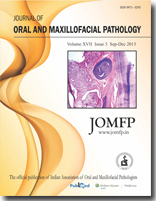 Aim and Objective: The aim of this study was to investigate the expression of Src protein (an osteoclastic factor) in peripheral and central giant cell granulomas (PGCG and CGCGs) of the jaws and the relationship between the expression of this protein and the clinical behavior of these two lesions. Materials and Methods: Thirty cases of PGCG and 30 cases of CGCG were immunohistochemically stained with Src. A staining-intensity-distribution (SID) score (proportion of stained cells × staining intensity) was used to evaluate immunoreactivity of the protein. Data were analyzed using statistical package for social sciences (SPSS) 17.0. Results: There were no significant differences in the Src expression and the SID score between PGCG and CGCG. Furthermore, Spearman's rank correlation coefficient showed that there was a significant correlation between Src expression and SID score within both PGCG and CGCG (P < 0.001; r = 0.87 and 0.75, respectively). Conclusion: The findings of this study suggest that the multinucleated giant cells share some similarities with osteoclasts and Src protein can be used as a new therapeutic target to inhibit osteoclastic activity. In addition, differences in immunoreactivity of this osteoclastic protein do not reflect different clinical behaviors of PGCG and CGCG. Background: Xylene in one of the non-substitutable chemical used in histology laboratories. However, it is known to have many toxic effects. The toxic effects of xylene include heart and kidney injuries, some fatal blood dyscrasia and other less dangerous problems, such as skin erythema, drying, scaling and secondary infections. The exposure and handling of xylene is maximum during deparaffinizing tissue sections. Aims : The aim of this study was to evaluate the efficacy of 1.7% dishwashing soap (DWS) solution as a deparaffinizing agent for hematoxylin and eosin (H and E) staining and compare it with xylene. Materials and Methods : Sixty sections of 4 μm were obtained from 30 formalin-fixed paraffin-embedded (FFPE) tissues and were considered in two different groups, groups A and B. Slides in group A were stained with routine H and E staining procedure; whereas, slides in group B were stained using 1.7% DWS as a deparaffinizing agent. Statistical Analysis Used: Wilcoxon matched-pairs signed rank test was used to calculate the test of significance (P-value significant at ≤0.05). Results and Conclusion : 1.7% DWS was found to be an effective alternative deparaffinizing agent to xylene and meanwhile facilitating as less biohazardous, economical and a faster deparaffinizing agent. Background: The annual mortality rate from head and neck squamous cell carcinoma (HNSCC) is over 11,000 worldwide. Squamous cell carcinoma of the head and neck (SCCHN) frequently metastasizes to the regional lymph nodes which are the first site of arrest of tumor cells that have invaded the peritumoral lymphatics, hence the strongest predictor of disease prognosis and outcome. Aim: The present study aims to compare the efficacy of frozen sections (cryosection), step-serial sectioning conventional H and E staining, immunohistochemistry (IHC) and RT-PCR analysis in detection of lymph node micrometastasis. 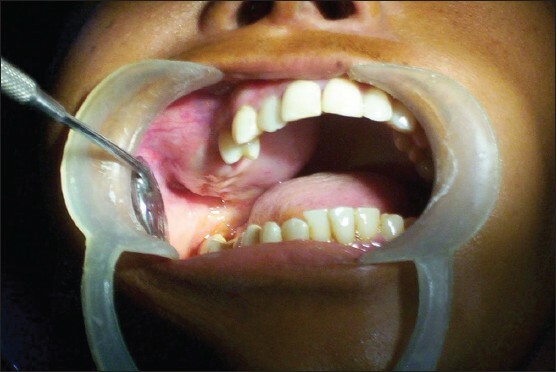 Materials and Methods: A prospective series of 30 patients who were diagnosed with primary squamous cell carcinoma of the oral cavity and underwent surgical treatment including unilateral or bilateral selective neck dissection were considered for the study. 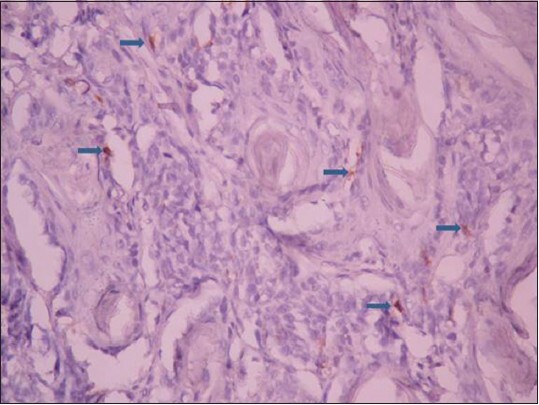 Result: Metastatic carcinomatous cells were observed in H and E staining of frozen section in 18 lymph nodes (54%) and in 19 lymph nodes (57%) in step-serial sectioned H and E-stained sections of the 78 lymph nodes from 30 patients. Carcinomatous cells were immunolabeled with pancytokeratin in 18 lymphnodes (54%). CK19 mRNA was detected in 33 lymph nodes of 16 patients. RT-PCR gave positive signals for 24% and 23% of lymph nodes positive by histopathology and immunohistochemistry. Conclusion: Our study demonstrated that RT-PCR is far more sensitive in detection of micrometastasis than any other technique used in routine procedures and immunohistochemistry. Fifty-three percent patients with micrometastasis detected by RT-PCR had large T3/T4 tumors. Prognosis was poor for patients who were positive for micrometastasis detected only by RT-PCR, among which two patients died within a period of 6 months. Oral cancer is one of the ten leading cancers of the world. In India, it is one of the common cancers and is an important public health problem. Tobacco plays significant role in etiology of oral squamous carcinoma. Tobacco which is chewed or smoked contains many alkaloids which are known carcinogens. Oral submucous fibrosis (OSMF) is a disease of the Indian subcontinent, which through immigration has a worldwide distribution. Betel nut chewing plays significant role in etiology of OSMF. The nut alkaloids have been shown experimentally to result in stimulation of collagen synthesis by fibroblasts in vitro, which can induce precancerous conditions. 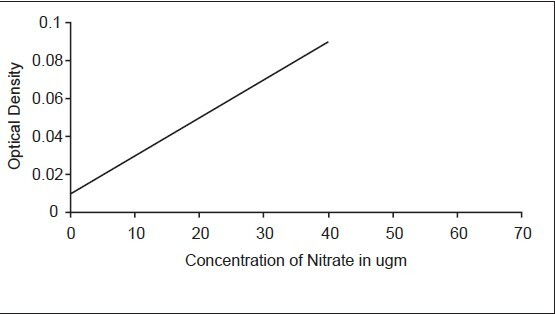 Materials and Methods: The present study was undertaken to detect nitrate and nitrite factor in saliva of cases with oral carcinoma, OSMF and normal individuals without any habits and to determine whether increased salivary nitrate and nitrite level is significant in oral carcinoma and submucous fibrosis using biochemical parameters. Conclusion: We conclude that the major inducer of oral squamous cell carcinoma (OSCC) is exposure to tobacco. Recent studies have demonstrated that oxidative and nitrosative stress contributes to the development of oral carcinogenesis through deoxyribonucleic acid (DNA) damage. Salivary composition of OSCC patients is substantially altered with respect to free radical-involved mechanisms. Introduction: The microwave oven has been used quite often for tissue processing, but there are very few studies describing its use in decalcification of bone or teeth. In this study we have attempted to decalcify bone and teeth using a microwave oven and compare the process and results with conventional decalcification methods. 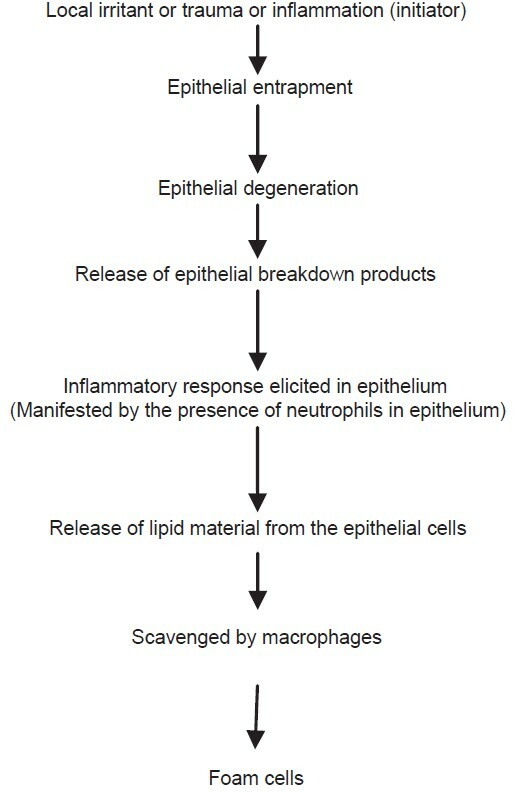 Aims and objectives: The objectives of the study were to determine and compare routine decalcification with microwave decalcification of bone and teeth using 5% nitric acid, 5% formic acid, and 14% ethylenediaminetetraacetic acid (EDTA) with respect to speed of decalcification, preservation of tissue structure and staining efficacy. Materials and methods: In our study the total sample size used for both routine and microwave decalcification was 30 premolar teeth and 30 pieces of condyles. The three solutions were dilute nitric acid (5%), formic acid (5%), and EDTA (14%). Each set consisting of the same type of premolars and condyles in each of the three decalcifying solutions were used in both manual method and microwave method. Results: The results in the present study confirmed the fact that the microwave method using nitric acid was indeed the fastest decalcifying method needing just about 2 days for condyle and 4 days for premolars, compared with routine decalcification. The results also showed that the overall histological picture was good with EDTA and formic acid irrespective of the methods used. In the routine method, nitric acid gave poor cellular detail when compared with microwave method. Conclusion: With our study we conclude that microwave oven decalcification is faster than routine decalcification irrespective of the decalcifying agents used. The tissue preservation and staining efficacy was good in microwave nitric acid decalcification compared to routine nitric acid decalcification. Both formic acid and EDTA show good tissue preservation and staining efficacy irrespective of the method used. Verruciform xanthoma is a very uncommon papillary growth seen chiefly in the oral mucosa. The presence of foam cells in the connective tissue papillae between the epithelial rete ridges forms the hallmark in its diagnosis. There has been wide speculation and various hypotheses put forth in explaining the etiopathogenesis of verruciform xanthoma and the origin of foam cells. This article aims to update the different hypotheses in understanding the pathogenesis of the lesion. Examination of microscopic sections of animal tissues reveals facts which are not always related to its normal histology or pathology. Processing of tissue specimens consists of lengthy procedures from the stage of surgical removal to the stained and mounted microscopic sections. Defects are common in tissue sections as a result of faulty procedures. These defects are referred to as artifacts. They lead to misinterpretation of histopathological diagnosis but at times they throw limelight into diagnosis. 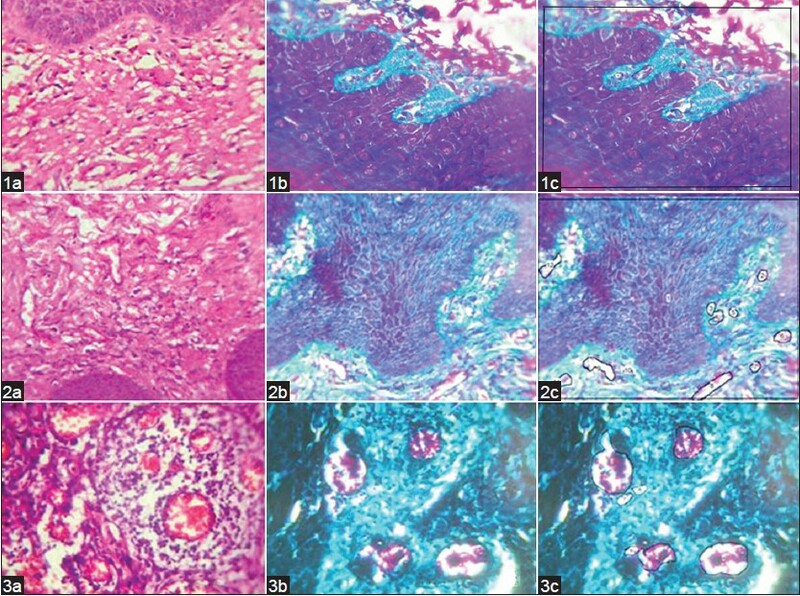 This paper attempts to put together all the facts regarding the various artifacts that are encountered in histopathology. Histopathology is an art of analyzing and interpreting the shapes, sizes and architectural patterns of cells and tissues within a given specific clinical background and a science by which the image is placed in the context of knowledge of pathobiology, to arrive at an accurate diagnosis. To function effectively and safely, all the procedures and activities of histopathology laboratory should be evaluated and monitored accurately. In histopathology laboratory, the concept of quality control is applicable to pre-analytical, analytical and post-analytical activities. Ensuring safety of working personnel as well as environment is also highly important. Safety issues that may come up in a histopathology lab are primarily those related to potentially hazardous chemicals, biohazardous materials, accidents linked to the equipment and instrumentation employed and general risks from electrical and fire hazards. This article discusses quality management system which can ensure quality performance in histopathology laboratory. The hazards in pathology laboratories and practical safety measures aimed at controlling the dangers are also discussed with the objective of promoting safety consciousness and the practice of laboratory safety. Myeloid sarcoma is defined as a tumor mass of immature myeloid cells that may be observed in a variety of locations including bone, skin, lymph nodes and soft tissues. However, oral involvement of myeloid sarcoma is extremely rare. These tumors are considered as specific lesions of acute myeloid leukemia. We present a case of a myeloid sarcoma of the upper vestibular gingiva in a 29‑year‑old woman who has no hematologic disease history. Multiple metastases were found in floor of the nasal cavity, left breast, and left lacrimal gland 12 months after primary diagnosis. Plasma cell myeloma (PCM) is a clonal neoplastic proliferation of terminally differentiated B lymphocytes (plasma cells/myeloma cells) that involves the skeletal system in a multifocal fashion. Even though jaw involvement has been reported in as many as 30% of cases, myeloma cells infiltrating into the pulpal tissue is extremely rare. Here, we present a case of PCM in which myeloma cells are seen infiltrating into the pulpal tissue of 46. Granuloma formation with multinucleated giant cells is seen in numerous diseases. A granuloma is a focus of chronic inflammation consisting of a microscopic aggregation of macrophages surrounded by a collar of lymphocytes and plasma cells. In this article, we present a case of granuloma formation with multiple Langhans giant cells along with an overview of the differential diagnoses, which include mycobacterium diseases, other bacterial infections, fungal infections, protozoal infections, and other granulomatous diseases. Ameloblastic fibrosarcoma (AFS) is a rare odontogenic malignancy with benign epithelial and malignant ectomesenchymal components. About 66 cases have been reported in the medical literature. We therefore report an additional case as well as a review of literature to add to the existing knowledge on this rare lesion. Myoepithelial carcinoma is characterized by nearly exclusive myoepithelial differentiation and evidence of malignancy. It may arise de novo or in preexisting benign tumors including pleomorphic adenoma and benign myoepithelioma. A 39-year-old lady presented with painless progressive swelling on the right cheek and right side of palate. On surgery, there was a mass in right maxillary sinus which was surgically excised and diagnosed on histopathology as pleomorphic adenoma. Subsequently, there were two recurrences. The first recurrence was in the right maxilla after 2 years that was removed surgically and diagnosed as pleomorphic adenoma. One year later, she came with rapidly progressive swelling in bilateral cheeks and face. Intraoperatively, there was a large tumor in both maxillary sinuses with extensive local infiltration. 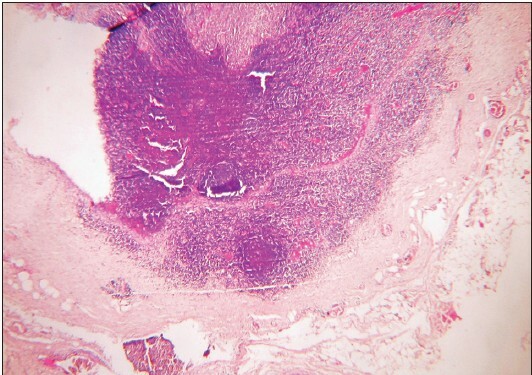 Histologically, it was diagnosed as myoepithelial carcinoma. Carcinoma ex pleomorphic adenoma is usually a high grade malignancy. It occurs most commonly in parotid gland followed by submandibular glands, minor salivary glands and occasionally in sublingual gland. To the best of our knowledge, this is the first case of myoepithelial carcinoma arising in a recurrent pleomorphic adenoma in the maxillary sinus. Stevens-Johnson Syndrome (SJS) and toxic epidermal necrolysis (TEN) are closely related severe, acute mucocutaneous reactions usually caused by drugs. They are acute life-threatening conditions and cause widespread necrosis of the epithelium. There is persistence of a high risk of SJS or TEN in relation to human immunodeficiency virus (HIV) infection associated with exposure to nevirapine (NVP). 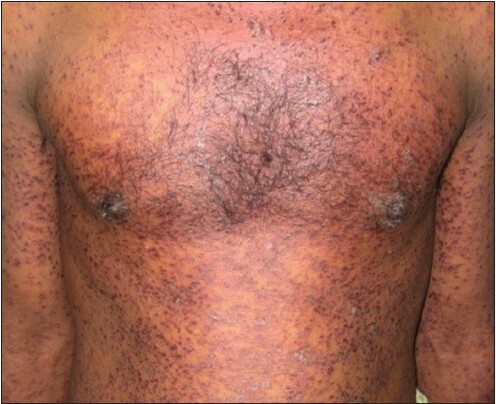 In this article, we present nine cases of SJS and one case of TEN in HIV-seropositive individuals who developed cutaneous, oral, ocular and genital lesions while being treated with NVP. The Primary central salivary gland neoplasms of the mandible are infrequent. Their clinical and radiographic features may be similar to odontogenic tumors, which are otherwise common. Their accurate diagnosis becomes troublesome.Hence, diagnosis should depend on stringent diagnostic criteria. 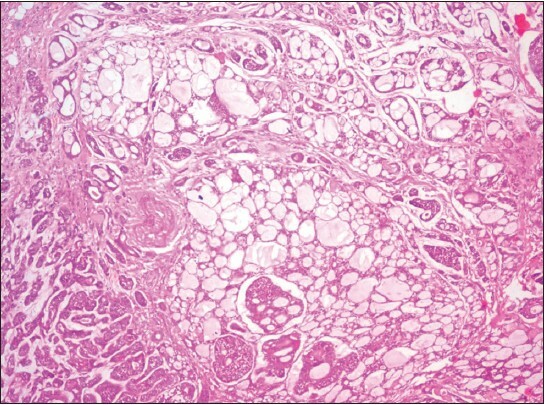 Adenoid cystic carcinoma is well known for its prolonged clinical course and its tendency for delayed onset of distant metastases. The long-term survival of these patients is therefore poor. Treatment modalities include surgery, radiotherapy and chemotherapy. The purpose of this paper is to report a case of primary central adenoid cystic carcinoma of mandible with an atypical presentation. Congenital granular cell tumor (CGCT), or congenital epulis, is an uncommon benign soft tissue lesion that usually arises from the alveolar mucosa of neonates and may cause respiratory and feeding problems. The histogenesis and clinical history of the lesion remains obscure. Treatment involves surgical excision and recurrences are rare. The present report describes a case of congenital granular cell lesion (CGCL) in the anterior segment of maxillary alveolar ridge of a 2-month-old female. This lesion was causing feeding problem and was excised under local anesthesia, with no recurrence even after 3 years. Nasolabial cysts are painless, submucosal, non-odontogenic jaw cysts presenting as soft tissue swellings in the maxillary anterior mucolabial fold lateral to midline, leading to elevation of nasal ala. Present case documents bilateral nasolabial cysts in a 69-year-old Asian female patient. In the present case, extraoral swelling of maxillary lip and elevation of nasal ala was observed on right side of the face. Intraorally, soft and fluctuant bilateral cysts were observed. Straw-colored fluid was aspirated from the right cyst. Radiographically, erosion of bone in a "cupping" fashion was observed in the region of left cyst. The cysts were enucleated using intraoral approach. Histopathology of the right-sided cyst revealed a cystic cavity lined by stratified squamous cells along with a few mucosal cells. At few places, stratified squamous and pseudostratified columnar epithelia with many cilia and goblet cells were also evident. Capsule was loosely arranged with fibrous tissue and chronic inflammatory infiltrate. 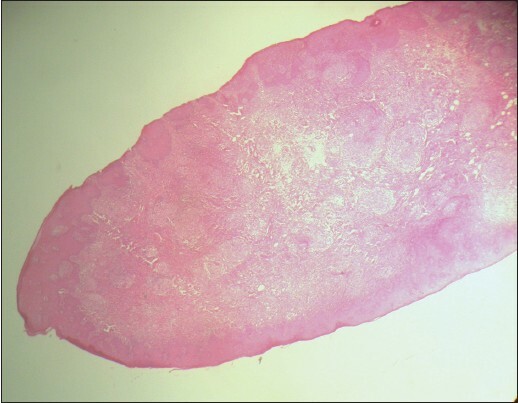 Left-sided cystic specimen showed two or more layered stratified squamous lining epithelium with thin capsule. Diagnosis of bilateral nasolabial/nasoalveolar cysts was confirmed. Neurilemmomas are benign tumors of neural origin composed of Schwann cell proliferation in characteristic patterns. Ancient neurilemmomas are usually longstanding growths that exhibit degenerative features that could be mistaken for malignancy. They are extremely rare in the oral cavity and present in older individuals of long duration. 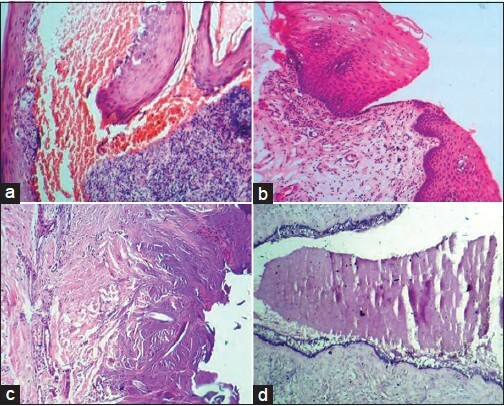 The authors report a case of ancient neurilemmoma in a young patient with short duration of growth. 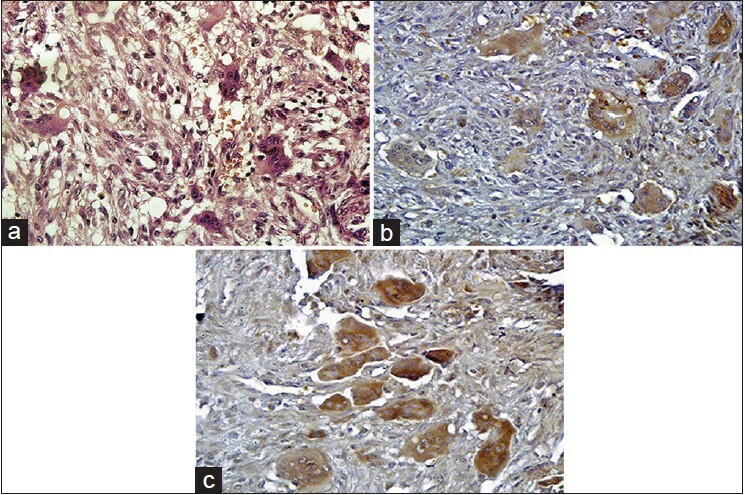 This unique case presented with remarkable histopathological features with respect to vascularity and atypia associated with degenerative change. It is essential to not mistake these features as malignant transformation so as to avoid radical procedures. Achondroplasia is considered as a form of skeletal dysplasia/dwarfism that manifests with stunted stature and disproportionate limb shortening. Achondroplasia is of special interest in the field of dentistry because of its characteristic craniofacial features. 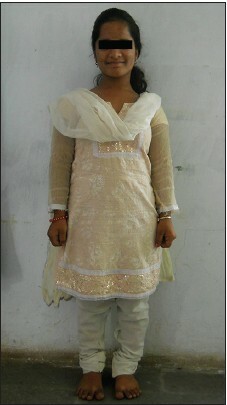 It has been considered as the most common short-limbed dwarfism syndrome. Very few authors have reported the presence of oligodontia in achondroplastic patients. 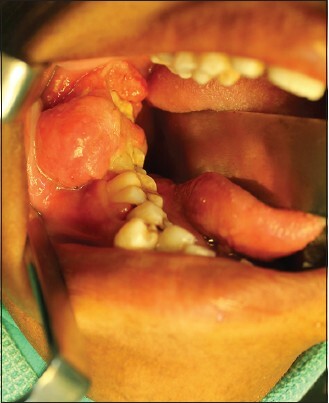 The present paper reports a rare case of oligodontia in a young, female, achondroplastic patient. Kimura's disease is a rare chronic inflammatory condition of uncertain etiology which has an affinity for the Asian population. It primarily involves the head and neck region, presenting as deep subcutaneous masses and is often accompanied by regional lymphadenopathy and salivary gland involvement. Peripheral blood eosinophilia and elevated serum immunoglobulin E (IgE) levels are characteristic features and the microscopic picture reveals lymphoid proliferation with eosinophilic infiltration. For years, Kimura's disease was believed to be identical to or part of the same disease spectrum as angiolymphoid hyperplasia with eosinophilia (ALHE). Recent reports, however, have confirmed that the two are, in fact, separate entities. 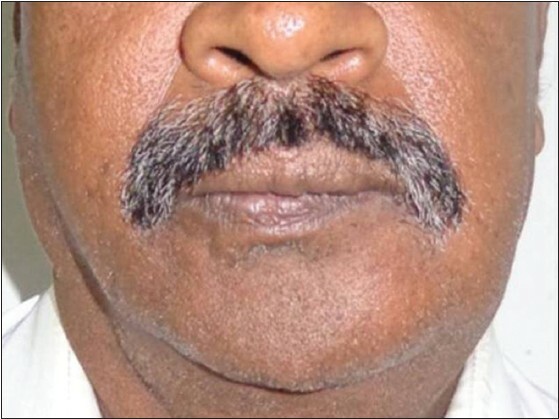 We report a case of Kimura's disease in a 22-year-old Indian male who presented with a subcutaneous mass, parotid enlargement and lymphadenopathy. The clinical presentation was suggestive of Kimura's disease and microscopic examination following biopsy of the lesion allowed us to make a definitive diagnosis. Bisphosphonates (BPs) are a class of agents used to treat osteoporosis and malignant bone metastasis. Despite these benefits, osteonecrosis of the jaws has recently emerged as a significant complication in a subset of patients receiving these drugs. 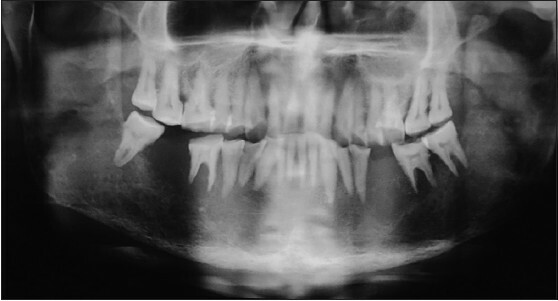 This case presentation focuses on a 62-year-old man with a 3-year history of monthly use of Zometa (zolendronic acid) for treatment of multiple myeloma, resulting in BP-related osteoradionecrosis of the jaws (BRONJ). This new entity remains a challenge with diagnosis as well as treatment. The goal of this paper is to improve clinicians understanding and provide a guideline for establishing a stage-specific diagnosis and prevention of BRONJ. Pyogenic granuloma (PG) is a reactive hyperplasia of connective tissue in response to local irritants, chronic irritation and hormonal changes. It is a tumor-like growth of the oral cavity frequently located in the region surrounding the anterior teeth or skin. It usually arises in response to various stimuli, such as low-grade local irritation, traumatic injury, hormonal factors or certain kinds of drugs. Clinically, the lesion appears as a smooth, lobulated, exophytic mass, exhibiting pink to reddish-purple color which can bleed on slight manipulation. PG has no malignant potential, but recurrence is common after surgical excision. 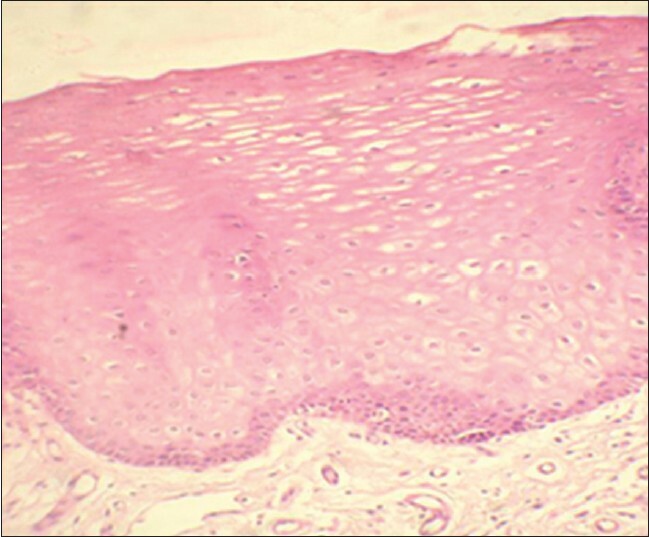 Histologically, the surface epithelium may be intact and may show foci of ulcerations or exhibit hyperkeratosis. Gingiva is the most common site affected followed by buccal mucosa, tongue and lips. The size of lesion varies from millimeters to several centimeters; rarely exceeding 2-2.5 cm. 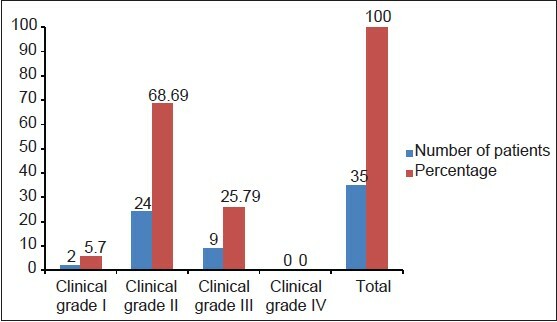 PG larger than 2.5 cm are seldom reported. Estrogen has been considered as a major contributing factor in most of the cases. Thus, occurrence of PG is mostly seen in premenopausal age due to high levels of estrogen. In this article, two unusually large oral PG have been reported. In the first case, a 25-year-old young male patient and in the second case, 70-year-old female patient have been described. In both the cases, the size of lesion was more than 5 cm which has been rarely reported before. Also one of the cases describe here is of a postmenopausal female, which questions role of estrogen as an etiological factor. Metastatic tumors of the oral cavity are rare, representing about 1% of oral tumors. Seventy percent of all tumors metastatic to the oral and maxillofacial region are adenocarcinomas, most commonly originating from the breast, kidney and lung. Carcinoma of stomach is generally described as one of the "captains of men of death". Usual sites of metastasis from gastric adenocarcinoma are direct invasion of adjacent organs, peritoneal dissemination, lymphatic metastasis and hematogenous spread. A primary carcinoma of the stomach may rarely metastasize to the oral cavity, it is important to bear this possibility in mind because such conditions may mimic a benign disease. This article describes a case of metastasis of gastric adenocarcinoma to the maxilla in a 50-year-old male. Fibrosarcoma (FS) is a malignant mesenchymal neoplasm of the fibroblasts that is uncommon in the head and neck and constitutes less than 1% of malignancies and approximately 6% of the soft tissue sarcomas. FSs rarely occur before the third decade except infantile type. This condition primarily affects long bones, and its occurrence in the cranium is rare (15%), with the mandible being the most commonly involved cranial site. 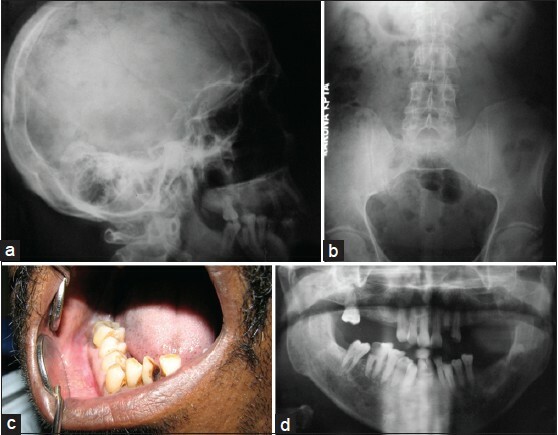 Here a case of primary FS in anterior maxilla of an 8-year-old male child is reported. This article is presented to document the rarity of FSs in the jaws of children with review of literature. Taurodontism is a developmental disturbance of a tooth in which body is enlarged at the expense of the roots. 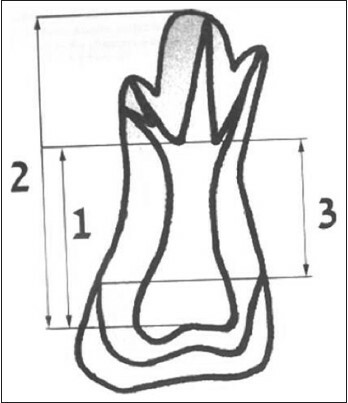 An enlarged pulp chamber, apical displacement of the pulpal floor and lack of constriction at the cementoenamel junction are the characteristic features. It appears most frequently as an isolated anomaly. But its association with several syndromes and abnormalities has also been reported. Endodontic treatment of taurodont teeth is stated to be complex and difficult due to the complexity in the tooth morphology. 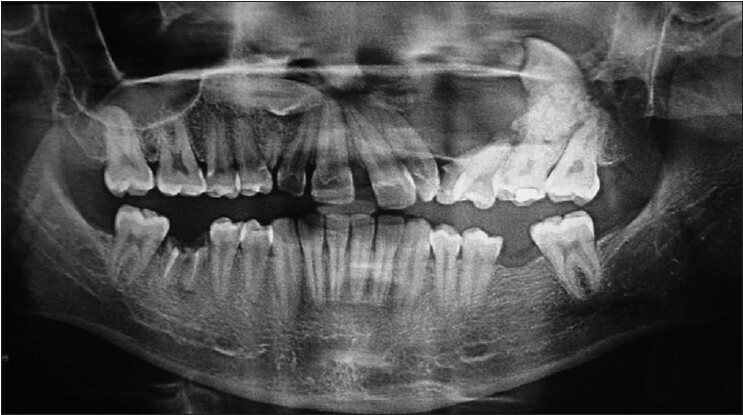 This case report presents a case of taurodontism in permanent maxillary molars and their successful endodontic treatment. The calcifying epithelial odontogenic tumor (CEOT) is a rare benign tumor of the jaws. Pindborg's tumor having clear cells is extremely rare. Twelve central lesions have been reported of which only three cases have occurred in maxilla. Clear cell variant is a distinct entity, has more aggressive biological behavior and higher chances of recurrence. Hence it is important that presence of clear cells be included in histopathological diagnosis. Here we present a rare case of clear cell CEOT having aggressive behavior. An 18-year-old male patient presented with a swelling in the neck with presumptive diagnosis of epidermal cyst (EC) that was enucleated, histopathological examination confirmed the diagnosis. Four years later the patient presented with another swelling with similar clinical features. It was located on the midline of the neck at the hyoid bone. Excision of cyst was done and microscopically it showed features of thyroglossal duct cyst (TDC). Two months later a new swelling was noted on the right side of the neck. A complete surgical excision was done and the lesion was diagnosed as a lymphoepithelial cyst. The purpose of this report was to analyze each of the entities that were present in this case; since, the presence of three different cervical cystic lesions in the same patient is uncommon. The orthokeratinized odontogenic cyst (OOC) and odontoma are the odontogenic cyst and tumor respectively that are minimally invasive neoplasms of head and neck region. 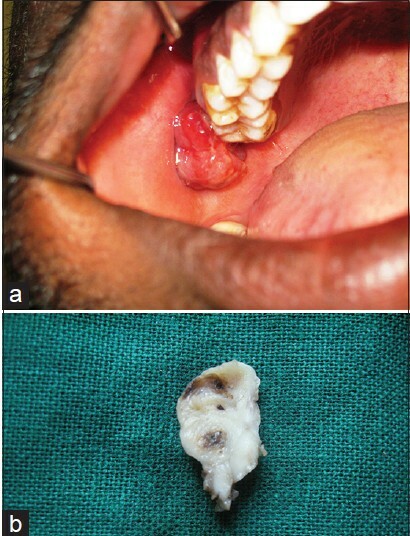 OOC is a rare variant of odontogenic cyst characterized by the presence of excessive orthokeratin covering the cystic lining. Odontoma is a benign neoplasm/hamartoma often discovered accidently on panoramic radiographs. 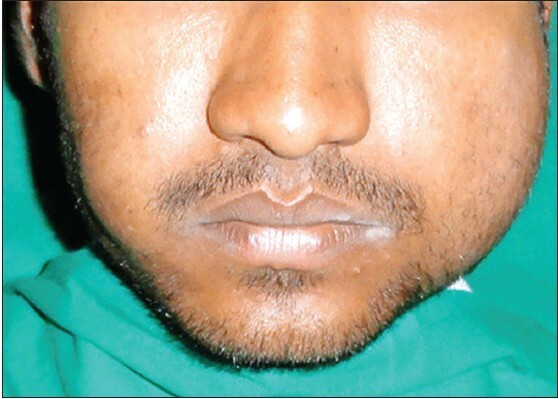 We came across a case of a 26‑year‑old male with swelling on his face along with difficulty in breathing. On the basis of radiographic and histopathological findings the final diagnosis of OOC associated with odontoma was given. However, there is no report in the English literature of the simultaneous occurrence of these two lesions and hence this case is very rare. It is unclear whether the two lesions were just coincidental or were actually related to each other. Cysticercosis is continuing to be a major health problem in developing countries. Radiological and serological techniques are routinely used for pre-operative diagnosis of cysticercosis. But fine needle aspiration cytology (FNAC) is cost effective and simple procedure, so it is important to be aware of diagnostic pitfalls in the cytomorphologic diagnosis of cysticercosis. 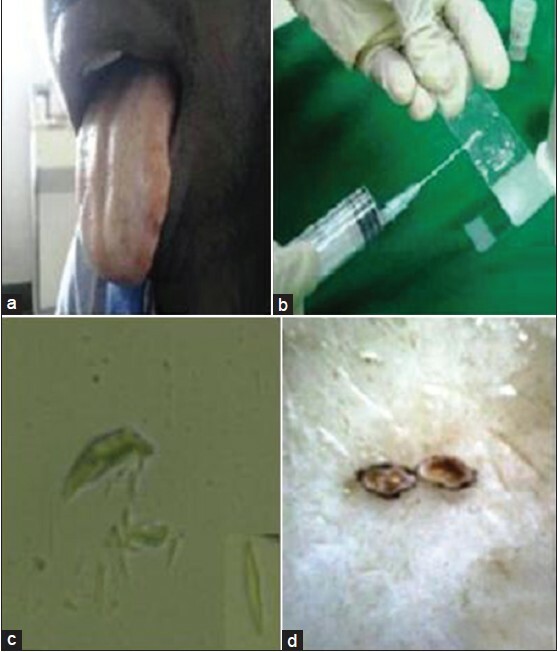 We present a case of cysticercosis of tongue, which accounts for only 34 cases in the world literature.